by Joseph Ratzinger (Pope Benedict XVI). Poor Pope Emeritus Benedict XVI. The retired pope isn’t even dead yet, and pundits speak endlessly of his legacy. Following allegations by Italian Archbishop Carlo Maria Viganò that Pope Francis lifted sanctions against disgraced American cardinal Theodore McCarrick that had been imposed by Benedict, voices have both lauded and criticized the emeritus pontiff. If true, some have noted that the American cardinal maintained a public profile during Benedict’s pontificate—was “God’s Rottweiler,” as he was once known, unwilling to back up his disciplinary measures? Alternatively, The Washington Post on 2 September reported that “Benedict has been used as a symbol of resistance for a segment of traditionalists who oppose elements of Francis’s reformist papacy.” Though even some pro-Benedict observers have acknowledged the latest ruckus is likely to hurt the emeritus pontiff’s reputation as pope and theologian, there is a less discussed aspect to his legacy we should seek to preserve: that of political philosopher. … [This] happens when the concept of human rights is detached from the concept of God. The multiplication of rights leads finally to the destruction of the concept of law and ends in a nihilistic ‘right’ of man to deny himself—abortion, suicide, and the production of a human being as a thing become rights of man that at the same time deny him.… It becomes convincingly clear that when separated from the concept of God, the concept of human rights finally leads not only to the marginalization of Christianity but ultimately to its denial. One might think such a quotation appears in Notre Dame professor Patrick J. Deneen’s Why Liberalism Failed, given its skepticism towards an exclusively rights-based conception of freedom. Yet the above is indeed from the pope emeritus, featured in an anthology of Benedict’s political writings that spans not only his time as pope, but his years as the theology professor Joseph Ratzinger and his many years as a cardinal. 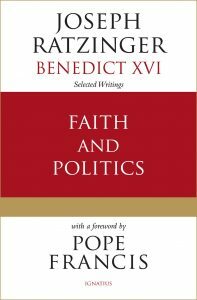 Ratzinger/Benedict addresses a broad variety of subjects in this book, spanning not only human rights and liberalism, but also secularism, the tension between truth and power in the public square, pluralist societies, and public ethics, among other topics. Building upon the above quote on rights and liberalism, Benedict notes, for example, how the fathers of liberalism believed God to be the foundation of “their view of the world and of man.” Benedict’s predecessor John Paul II recognized that this form of liberalism could largely be affirmed by Christian teaching. Yet even here Benedict, like Deneen, is wary: “the concept of God is detached from its biblical foundations and thus slowly loses its concrete force.… Liberalism loses its own foundation when it leaves God out.” A liberalism detached from external objective truth descends into a subjective pragmatism that can have deadly results. Can politics accept truth as a structural category? Or must truth, as something unattainable, be relegated to the subjective sphere, its place taken by an attempt to build peace and justice using whatever instruments are available to power? By relying on truth, does not politics, in view of the impossibility of attaining consensus on truth, make itself a tool of particular traditions that in reality are merely forms of holding on to power? What happens when truth counts for nothing? What kind of justice is then possible? Must there not be common criteria that guarantee real justice for all—criteria that are independent of the arbitrariness of changing opinions and powerful lobbies? Is it not true that the great dictatorships were fed by the power of the ideological lie and that only truth was capable of bringing freedom? When we reduce truth to yet another rhetorical device—or worse still, deem it irrelevant to politics—we are often inclined to replace it with pragmatism, “by which the strong arm of the powerful becomes the god of this world.” This is exactly what we witness in the trial of Jesus: his accusers, uninterested in justice, press Pilate by referencing the tools of power and pragmatism. “If you release this man, you are not Caesar’s friend,” they tell him, reminding him that the wrong choice could lead to his removal from power. “In the end, concern for career proves stronger than fear of divine power,” Benedict notes. The sidelining of truth to power in politics ultimately results in violence, typified in the sentencing of Jesus, who is subjected to the full force of the Roman politico-military machine in his scourging and ultimate crucifixion. Casey Chalk is a graduate student at the Notre Dame Graduate School of Theology at Christendom College, and a contributor for The American Conservative.